Cherrystone Bar – Chesapeake Chapter U.S.L.H.S. Photo taken at Choptank River location. The original request to build a small, screwpile lighthouse to mark the entrance to Cherrystone Harbor was in 1853. Congress later appropriated $10,000 on August 3, 1854. Cherrystone Bar Lighthouse was completed and first lighted on January 1, 1858. It was a white, hexagonal screwpile lighthouse built just south of Cape Charles, Virginia. The light was a fourth order Fresnel lens with a Franklin lamp. During the Civil War the lighthouse was attacked by Confederates, but the light was reestablished in 1862 by Union forces. Through the years, Cherrystone Bar Light was somewhat uneventful except for a few instances. In an inspection report dated August 23, 1870, the inspector noted that the general condition of the dwelling was “good”, but not “clean”. The inspector also noted that the head keeper at that time, Isaac Pyle, had been absent from the station since August 18, a total of at least 6 days! On a sad note, in 1903, Head Keeper Oliver R. Hudgins died from blood poisoning which was caused by a crab bite on his hand. He was only 42 years old. By 1916, improvements had been made to the harbor at Cape Charles and the Lighthouse Board recommended replacing the lighthouse with a new structure using acetylene gas at a cost of $12,800. The funds were appropriated in 1917 and the new gas light and fog bell was installed on a black skeleton tower attached to a black caisson in 1918. The fourth order lens was removed and sent to Solomon’s Lump Lighthouse and the lighthouse was deactivated on October 1, 1919. Because the lighthouse was in such good condition, it was removed and put on a barge that was sent to Cape Charles in 1920, where it was stored for the winter. In the spring of 1921, the lighthouse was put on another barge and towed up the bay to the site of the old Choptank River Lighthouse in Maryland which had been destroyed by ice. It was stationed there for the next 43 years, making it the only lighthouse to ever be moved to another site and be used as a working navigational aid. 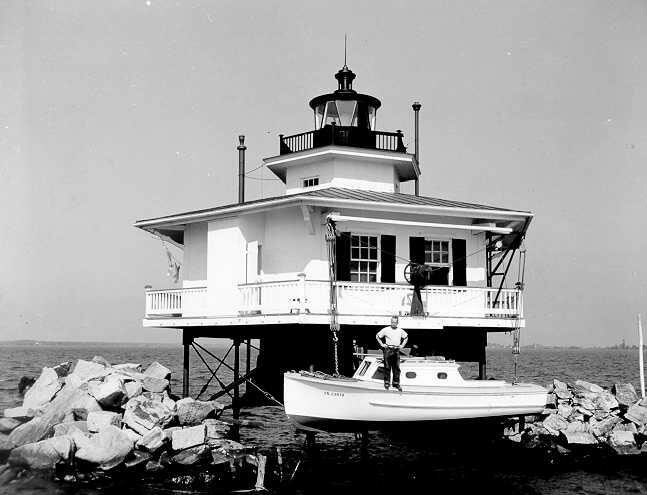 The old Cherrystone Bar Lighthouse (Choptank River Lighthouse) was eventually dismantled in 1964.